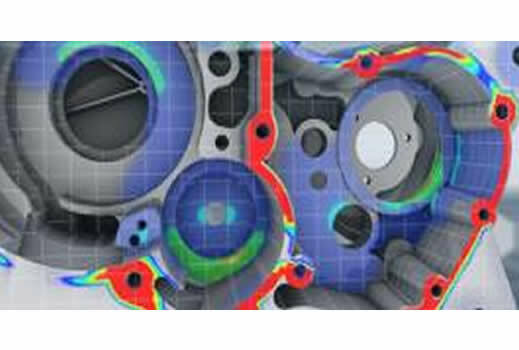 Predictive Engineering brings to bear more than 20 years of finite element analysis FEA consulting experience in solving the most difficult mechanical engineering analysis challenges. We have direct and validated experience in detailed stress analysis, linear dynamics (normal modes, sin sweep, PSD or seismic analysis), ASME Section VIII, Div. 2 pressure vessel analysis from heat exchangers to NQA-1 nuclear and likewise, from construction to transportation, nonlinear contact analysis for complicated assemblies and plastic thread design, high-power transmissions and gear assemblies, off-shore oil patch winches, top drives, and many other fields. We have also been active in the renewable energy field with complete mechanical stress and dynamic analysis of wind turbine systems, solar panels and photovoltaic systems. We live and breathe FEA analysis and our experience has been earned the hard way by having our models validated in test and in service for over 20 years. Our work portfolio ranges from deep-diving submarines to large motor home chassis analysis to USAF satellites. The only commonality in our FEA consulting work is that every project has passed our clients’ requirements with flying colors. Contact us to discuss your project. 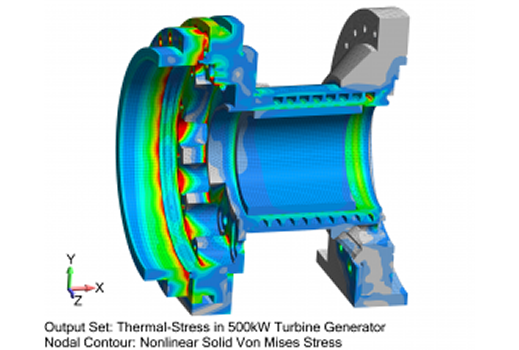 Recently we just completed a coupled computational fluid dynamics (CFD) and finite element analysis (FEA) project on a “turbocharger” to an existing 60kW gas turbine. The energy physics of this turbocharger is to spray water droplets into the inlet of the compressor side of the turbine thereby increasing the density of the already 100% saturated air. This heavy air mixture is then combusted with increased gas flow, yielding a 10 to 15% boost in energy output from the turbine. In other words, one can take a 60kW turbine and turbocharge it to ~70kW at no more than 1% of the original turbine cost. The challenge for our client (an electrical utility) is that this device is bolted onto the flow housing inlet to the gas turbine. 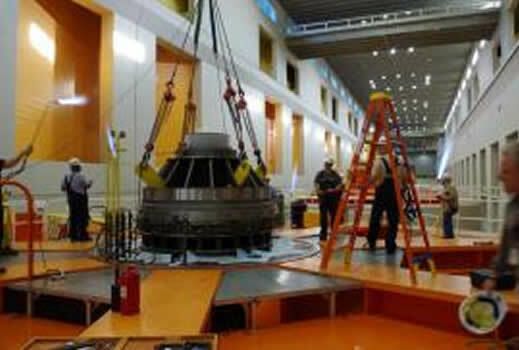 If this device fails, then parts would directly enter the turbine, leading to a very expensive repair operation plus unexpected disruption to the utility’s power grid. Air inters through the filter house and then around the housing, through some guide vanes and then into the compressor-side of the gas turbine. The CFD analysis (STAR-CCM+) provides us with component pressures over the housing and the water spray system which were then mapped onto a FEA model (FEMAP). 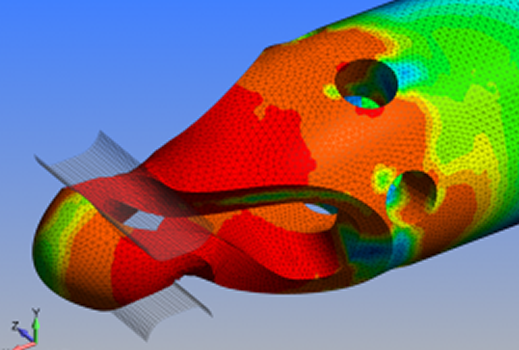 The FEA model was then exercised through a static stress, normal modes and modal frequency analyses (NX Nastran). To verify this work, a CFD mesh convergence study was done and the FEA work was checked against hand calculations. Results assured the client that the add-on device was more than structurally adequate and could easily handle the power plant’s dominate 60Hz vibration plus any multiples. Predictive Engineering cut its teeth on vibratory conveyors and today, we can say that we have over 20 years’ of FEA consulting experience with vibratory equipment. This project arose due to a failure analysis requirement. An existing design that was only slightly modified was experiencing base frame cracking during operation. Our analysis showed that the design was robust and that the base frame cracking could only be occurring due to movement of the support structure to the vibratory conveyor. Leveraging these results, our client was able to demonstrate that the failure was initiating outside of their control and due solely to movement in the support structure to the conveyor. Although this was somewhat a foregone conclusion by our client, Predictive’s engineering report provided clear justification that additional steel was required to stiffen up the support structure and, to be done, at no cost to our client. Our client had several plastic material options from ABS, Noryl, PSU to PVC for use as high-pressure core tubes within their reverse osmosis water purification system. The challenge was which material would provide the highest external pressure load rating prior to collapse. The uniqueness of this work was the emphasis on potential failure mechanisms outside of the normal elastic buckling regime using a nonlinear approach that would capture material plasticity along with large deformation / large strain behavior. Analysis results allowed the client to optimize the material selection based on cost and performance. Analysis of plastic panels in aerospace structures can be tricky. Cost for tooling and testing is a significant investment so it is important to get the design right before moving forward. The client requested that we evaluate their structure per RTCA-DO-160, which had a maximum PSD acceleration of 0.04 g2/Hz. This is a very low spectrum by most standards, but it is complicated by the fact that the test duration was 3 hours. In order to reduce analysis time, a mesh convergence study was performed to ensure the mesh was sized optimally to provide reasonable runtimes while accurately capturing the behavior of the structure. We checked model sizes from 140,000 nodes all the way up to 900,000 nodes, before settling on a size near 300,000 nodes. With the proper mesh density selected, the structure was analyzed in NX Nastran. The PSD analysis showed 3-sigma stress was below the yield stress but high enough in the fatigue curve to be worrisome in the 3 hour test requirement. The cumulative damage for the high stress regions was calculated using Miner’s rule and it was found that the part would likely fail the test in less than two hours. With this analysis work, the client was able to avoid failed testing on an under-designed part. A customer came to us with a request to simulate an aerospace electronics structure they had already built and tested. The structure was a complex assembly of aluminum trays with connections between each tray layer and circuit boards mounted in each tray. Normal modes analysis was performed on the structure and the stiffness of the connections between layers was calibrated such that the natural frequencies of the model matched the frequency response test data. With the confidence of a model correlated to test data, we proceeded to modify the structure per the customer’s design changes and performed the PSD analysis on the new structure. A small titanium valve was meshed using a combination of hexahedral and tetrahedral elements and subjected to an array of analyses, including normal modes, a 1 g check-out, and a static stress analysis of a “pull and twist” load. With each of those procedures completed, the valve was subjected to a PSD and shock response evaluation. The valve passed the static and PSD analysis but failed the shock analysis. Areas of improvement were reported to the client for redesign, preventing a costly test failure. Compact electrical connectors with built-in electronics are very sensitive devices, and when they are sent into space one must be totally confident in the thermal and structural behavior of the device. A model of the circuit board was built with the high-power chips discretely modeled and an isotropic approximation of the board. Large chips were modeled with their leads and smaller chips had nodes directly connected to the circuit board. Steady state thermal analysis of the board and housing showed the maximum temperature at each chip. The circuit board from the thermal model was utilized for the structural model. The stiffness of the structural model was adjusted to correlate the natural frequency with provided test data. With the structural model matching test data we proceded with normal modes, PSD, and shock analysis of the structure. When process engineers determined that opening and sealing pressure vessels was a significant production bottleneck, designers were tasked with redesigning the sealing mechanism for the main flange of the vessels. When the standard flange and swing-bolt configuration was replaced with a more elegant bayonet-style mechanism, the structure required FEA to ensure that the new components could handle the pressure loads and that the vessel would remain sealed throughout a range of operating conditions. The first step of the investigation was a thermal-flow CFD analysis to determine the temperature gradient through the structure during operation. The thermal profile was used in combination with pressure, dead weight, bolt-preload and clamping force as a load in the structural analysis. The stress and contact pressure results provided the client with the information they needed to choose robust materials and have confidence in the capability of their new design. Structural and vibration analysis of space-frame structures on wheels is something we have been doing for decades from motorhomes to dump trucks to utility trailers. The basic engineering concept is a steel frame (plate mesh) in which a maze of steel tubing (beam elements) are welded onto. The usual request is to determine whether or not the structure can bear the applied loads of equipment weight (2x) followed by transportation body loads (braking, cornering and “pothole”) and then vibration. Model economy is fundamental and thus the pursuit of a highly idealized structure of using plate elements for the main frame and then beam elements for everything else. Equipment weight is simulated using mass elements. Boundary conditions can be tricky to not over-constrain the frame since the spring/axle combination interacts with the frame in a flexible manner. 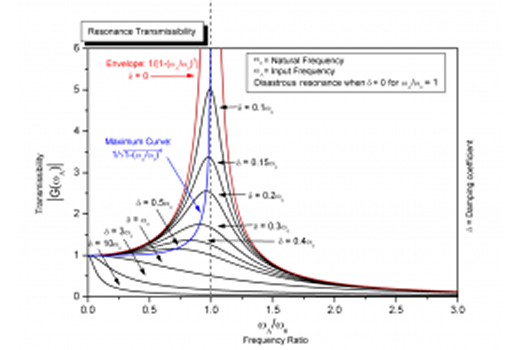 Once the frame passes the stress requirements, the vibration analysis looks at the normal mode response with the aim to ensure that all significant modes are higher than 12 Hz. If this criterion is met, a PSD analysis is performed. A common spectra is that of MIL-STD 810G 514.6 for the three orthogonal directions. For this particular project, we followed our standard procedure from stress to vibration and then PSD analysis. After a couple of design modifications, the trailer was shown to pass the 3 sigma (3σ) PSD RMS stress requirements. The trailer is in service today for a major NW electric utility. Winch assemblies fall under the category of “if it breaks, it could kill someone”. Although everything is tested prior to manufacturing, finite element analysis (FEA) allows much greater confidence that the structure will survive once built. For winches, lifting hooks, cranes and hoisting equipment (all of which have been analyzed by Predictive Engineering) that must pass certification that they can bear 5x or even 10x of their rated load, linear analysis is not possible. That is, the certification requirement is that the device must not fail catastrophically and usually includes a statement that upon load removal, that no visible deformation is visually noticeable. This last requirement is a wide-open design opportunity since most structures can handle several percentage of plastic deformation and still return to near net original shape (i.e., no visible deformation). 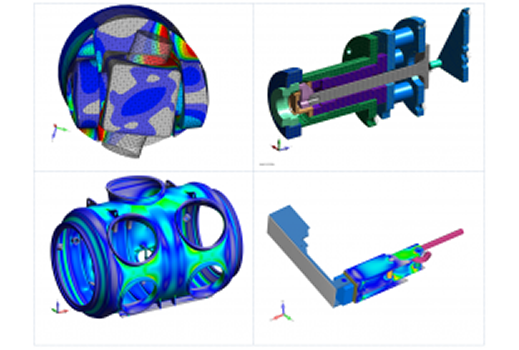 Using the ADINA (Advanced Dynamic Incremental Nonlinear Analysis) solution engine within NX Nastran, the winch assembly was virtually loaded and unloaded (5x rated capacity) using nonlinear material properties. The beauty of this technique is that the winch material (common HSLA steel with a yield strength of 34,800 psi with plastic strain to failure of 45%) is allowed to plastically deform at known stress concentrations and upon unloading one can easily assess whether not the deformation meets the certification limits. By using such common-sense analysis techniques, we were able to optimize the winch assembly to a much a greater extent than using linear techniques. This was one of Predictive’s marquee projects and selected results were published in the 14th International LS-DYNA Users Conference “Broad-Spectrum Stress and Vibration Analysis of Large Composite Container.” Our client was deep into the design process and had already done several FEA simulations on the container when they approach Predictive. It was their understanding based on earlier FEA work that their complex glass-fiber vacuum infused composite “clam-shell” container was good to go. There was only one problem. The container is manufactured such that it is split into a bottom and a top sections. Each section is more or less 3x2x10m. When joined the container is 3x4x10m. The closure for the container is an aluminum extrusion with an inner O-ring rubber seal. The container is sealed by lowering the top section onto the bottom section and then closing the evenly spaced latches around the perimeter of the container. This relatively loose joint was modeled as seamless or continuous aluminum section in prior work. As one can guess, once this closure was modeled “loosely” as it would behave in the real world, the container’s design was found to be insufficient. Although this project was done mostly with LS-DYNA due to nonlinearities, much of the initial composite scoping work on the laminate and sandwich sections were done using NX Nastran. Linear FEA work represents perhaps 80% of the analysis work performed today and is always valuable given good mechanical understanding of how structures respond in the as-built condition. Our client had assumed that the closure would behave as single continuous structure (i.e., transmit shear across its interface) when in reality little to no shear would be transmitted. Although it seems obvious in hindsight it did provide lots of head-scratching as we tried to figure out how they had arrived at their initial results. The client produces a very unique type of variable speed transmission where the amount of power and energy transmitted is dependent upon the amount of liquid contained within the rotating elements. This particular design had been operating for years and the client wanted to explore the design’s “margins”. That is to say, how much farther could they push the design without fear of failure. Mechanically, the load case consist of a centripetal force combined with pressure load. Since the pump heats up during operation, thermal-stress effects were also considered given the pump’s material mix of aluminum (Almag 535) and steel (A36 an 4140). The model was meshed using 10-node tetrahedral elements and end up having several million DOF. Along with the transmission or pump housing components, a detailed shaft analysis was performed to determine if the design margins were sufficient to prevent fatigue failure of the 4140 pre-hard steel. Stress results indicated, obviously, that the design was well within its design limits and also opened several doors for component optimization and the potential for increasing the operating RPM and torque delivery. The brazing process is a well-known metallurgical joining technology where a low melting point eutectic compound with good wetting characteristics can be used to join two dissimilar materials. For the joining of brittle ceramics to metals, the build-up of residual stresses upon cooling is a concern that sometimes morphs into a crisis when parts start breaking unexpectedly in service. For many years, the standard analysis technique was to model the braze layer as a perfectly welded connection (glued contact), define the corresponding modulus and CTE values for the ceramic (Al2O3 – alumina or zirconia) and the metal component (titanium or stainless steel) and then apply a temperature delta of 500 or 600 C. The resulting residual stress state was then considered “good enough” for engineering purposes. That is, it was possible to drive the design of oval pass-through connectors, plasma tube orifices and other electronic high-voltage components toward lower residual stresses. Nevertheless, we all knew that this work was approximate and that to obtain higher accuracy it would be necessary to completely capture the nonlinearity of the braze process from its semi-solid state just after solidification down to room temperature and likewise, the complete mechanical property temperature dependence of yield stress, elastic modulus and CTE. For this work, we used LS-DYNA (please see our LS-DYNA text listing for details). Pipe support analysis is a field onto itself given dense code requirements and value proposition that oftentimes when a pipe breaks due to being poorly supported, the damage can be in millions from flooded apartments or the loss of steam power to a medical center. Predictive has worked on pipe support analysis for apartment buildings, underground piping runs to supply high-pressure saturated steam energy to a hospital complex, pressure vessel inlet/outlet piping systems etc. What we bring to the table is our expertise to idealize an engineering system into a predictive model. In this project, the client had several vertical piping runs that extended from ground floor and then up 11 stories in two separate towers. Their concern was whether or not the pipe clamps could withstand potential “once-in-a-lifetime” events due extreme cold and hot conditions. Analysis work showed that during hot days, as the pipe expands, all the weight of the pipe would be supported by the top most clamp. This led to several redesign efforts until an optimized clamp design could be proposed that was easy to manufacture and given tight space requirements, could be retrofitted. This was a classic stress analysis of a gearbox housing. It is something we done many times at Predictive Engineering for off-shore equipment, motorcycles, automotive, aerospace and now for a small electric utility vehicle. The client was great to work with and supplied us with the load path breakdown from gear-to-gear-to-gear. Although this is something we have done in the past, teamwork is always great since it helps prevents cross-communication. The objectives of this work was to determine stress levels in the gearbox housing to assess durability and if, there would be sealing issues between the main casing and its cover. Oil leakage between seals can be determined via contact pressure plots. The trick on such work is to ensure sufficient mesh density between the contacting surfaces that one sees true pressure and not a mesh artifact. Prior work with Norton Motorcycles helped to refine this seal analysis. Final results showed that the design was adequate for service and would be “leak free”. Electric small-cargo utility vehicles are subjected to some interesting loading. For driveline components, it is basically taking the weight of the fully loaded vehicle and multiplying it by at least 2x. Our client wanted to confirm that their new differential case and driveline assembly could handle the typical road-way obstacle launch and subsequent landing on a hard surface. The key loading component was the differential housing case made out of SAE D4512 ductile iron. The torque and impact load was transferred into the housing via pin and bearing contacts. Due to the fatigue sensitivity of the iron, the mesh was converged around regions of high stress. Final results indicated the potential for low-cycle fatigue failure which were then later confirmed by the client during testing. Using General Motors GMW3172, Table 27 PSD Profile and that for a 12g pothole (triangular pulse of 20 ms) from Table 30, a super simple vibration analysis was done on a printed circuit board (PCB) having three components. The PCB was supported at its four connections and then shook. This might go down as the most basic FEA consulting project we have ever done. The construction of the engineering report actually took more time than building and validating the model against Miles equation and client supplied mass data. Our supplier to GM needed the results quickly to demonstrate compliance and in less than three days everything was done from credit card payment to delivery of engineering report. Although it was fast, what the client was paying for was that the results would pass review without any time consuming “reviewer-analyst” ping-pong. Our client had a simple requirement that their 3-way control valve needed to pass a standard PSD spectrum of 1.31g2/Hz from 100 to 500 Hz with a slight taper to 2,000 Hz. We reviewed the qualifications, and based on our prior FEA consulting experience, we recommended that the acceptance and proto-qual levels be skipped and that we only analyze the Qualification spectrum for conservativeness and to keep analysis costs to a minimum. The model was built from the client’s CAD data using Femap and then analyzed using NX Nastran. The 3-sigma stress results were well below the MMPDS fatigue curve for 6061-T6 and given client’s fatigue specification, no damage was predicted. Likewise the static acceleration load proved that the design was robust and if needed could be trimmed. The final engineering report showed no surprises and the project was signed off. HVAC equipment installed on the top of tall office and apartment towers is often required to have a 20 year or more duty cycle. These high-cycle fatigue requirements are due to the difficulty of performing regular maintenance and that often times, helicopters must be used to replace any large blower components that have failed. Our client is a world-leader in this industry and wanted to ensure that their energy-efficient fan damper system could meet and exceed this requirement. This FEA consulting project started with client supplied CAD data and then proceeded to an idealized hex and plate model of the fan system. A normal modes analysis was initially done and then followed by a sine sweep. The FEA results were validated against shaker table data and shown to be in good agreement. Based on this confidence, the damper section of the model was subjected to maximum air flow forces based on their peak operational flow. Under this worst case scenario, the system showed stresses below the fatigue limit for all structural components. Based on our engineering report and shaker table data, the equipment has gone into production. The PSD and shock simulation of electronics hardware is a well-known practice within Predictive Engineering’s FEA consulting group. Our client had developed a new high-power DC converter where its printed circuit boards (PCB) were heavily weighted with transformers and application specific integrated chips (ASIC). The analysis work was done in two stages: (i) PSD analysis of the PCB for fastener integrity and (ii) shock analysis of the complete system to ensure that nothing flies off. Results showed a minimum 2 to 1 safety margin for all connections internal and external and the project was wrapped up and delivered. Many high-technology components require the use of ceramic components due to their unique thermal and electrical properties. If metallic components are brazed onto these ceramics, one can expect to see the development of significant thermal-stresses as the assembly cools down from the typical 600 C brazing temperature. Although this type of stress analysis sounds routine, challenges arise with the idealization of the braze interface and the temperature dependency of the coefficient of thermal expansion (CTE) of Kovar and stainless steels. Over the years, we have done numerous projects where we have numerically investigated the brazing process based on linear and nonlinear material properties. Given that our FEA thermal-stress results have been validated in test and in service we feel confident that our brazing models are doing a good job in simulating reality. Based in the silicon forest, Predictive Engineering has done a variety of projects to investigate the thermal, thermal-stress and vibration characteristics of electronic interconnect devices. As the push to miniaturize devices means that simple cables are often tasked with performing circuity functions or termed as Active Optical Cables where the cable itself is performing the digital to optical conversion on the fly. Since these devices generate significant heat, thermal analysis is a key design requirement. Along with thermal, a vibration analysis is often required to meet aerospace requirements. A typical analysis scenario is to investigate the thermal profile of the device via steady-state conduction and then add radiation and finally conjugate heat transfer to capture the complete thermal behavior. However, a simple FEA thermal model is often sufficient to generate sufficiently accurate thermal-stress results. The vibration analysis is typically based on a PSD profile. 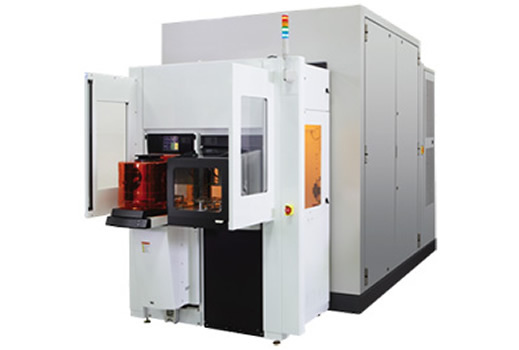 Of more direct interest is the fatigue analysis of the solder ball or BGA grid of Application Specific Integrated Chips (ASIC) mounted to the printed circuit board (PCB). Using strain results from the thermal-stress in combination with 3 sigma PSD strains, a basic Steinberg type fatigue analysis can be quickly carried out on the solder joints. In other work we have investigate the lead failure as the chip independently moves against the PCB. This more detailed work is harder to justify since most modern ASIC manufactures have greatly improved the robustness of their metal lead connectors leaving just the in-plane solder connection as the major worry. Besides this thermal-stress fatigue work, the main body of the connector was studied for its response to the PSD excitation and whereas to pass this device, it was required to perform a detailed fatigue analysis based on 1-, -2 and -3 sigma PSD stresses as applied to the MMPDS fatigue curve for 6061 aluminum. This cumulative damage approach where the number of cycles were based on the crossing frequency and the statistical percentage of the PSD stress, demonstrated that the connector could pass with margin. Starting with a preliminary frame design for a mineral sizer, an FEA model was built and used to determine problem areas and help design addition support structures. The massive dead weight of the material and structure, combined with tight size restrictions, required an efficient model that allowed easy design changes and quick stress analysis. Here is a case study example of stress analysis. A pair of eyeglasses with a built-in digital display required a detailed FEA model to recover accurate deflection and rotation data necessary for optics calculations. The assembly consisted of the frame, optics, electronics and stiffening members. With multiple materials with differing CTEs, both static loads and thermal boundary conditions were necessary to fully capture the behavior of the device under operating conditions. A simple FEA model with static body acceleration loading was used simulate crash scenarios. Forces were recovered a at seat mounting locations for 108 different loading scenarios. Custom programming was implemented to automate post-processing. This project involved FEA modeling, meshing and analysis of integrated power module generator housing. Model loading included thermal loads, pressure loads, static forces and interference fits. The housing was evaluated against ASME Section VIII, Div. 2 allowables. This project was a mixture of classic thermal-stress analysis with the results presented against the ASME stress allowables for the client’s material selection. The objective of this analysis was to investigate stresses near the intersection of two cross drilled holes within an A356-T61 cast aluminum structure. With extreme internal pressure, the stresses at the intersection were reaching the allowable limits of the material. This study determined that at design pressure, a different material selection was required, regardless of reinforcement. The objective of this analysis was to investigate stresses and deflections within a bent axis hydraulic pump. 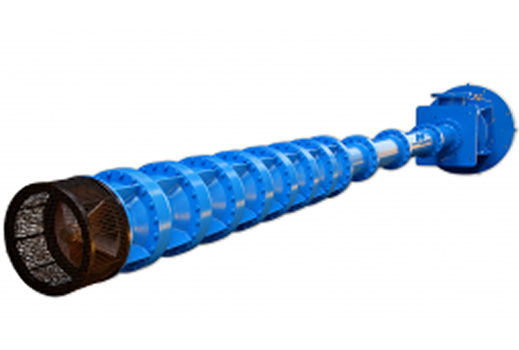 The cast iron pump experiences extreme internal pressure and external loading. The FEA model guided the design of the casting by illustrating where reinforcing material was needed and where weight can be saved. Local deflections at interfaces were recovered to ensure that hydraulic seals between mating components would not be compromised. Using General Motors GMW3172, Table 27 PSD Profile and that for a 12g pothole (triangular pulse of 20 ms) from Table 30, a super simple vibration analysis was done on a printed circuit board (PCB) having three components. The PCB was supported at its four connections and then shook. This might go down as the most basic FEA consulting project we have ever done. The construction of the engineering report actually took more time than building and validating the model against Miles equation and client supplied mass data. Our supplier to GM needed the results quickly to demonstrate compliance and in less than three days everything was done from credit card payment to delivery of engineering report. Although it was fast, what the client was paying for was that the results would pass review without any time consuming “reviewer-analyst” ping-pong. Using General Motors GMW3172, Table 27 PSD Profile and that for a 12g pothole (triangular pulse of 20 ms) from Table 30, a super simple vibration analysis was done on a printed circuit board (PCB) having three components. The PCB was supported at its four connections and then shook. This might go down as the most basic FEA consulting project we have ever done. The construction of the engineering report actually took more time than building and validating the model against Miles equation and client supplied mass data. Our supplier to GM needed the results quickly to demonstrate compliance and in less than three days everything was done from credit card payment to delivery of engineering report. Although it was fast, what the client was paying for was that the results would pass review without any time consuming “reviewer-analyst” ping-pong. A 3D solid FEA model was created with static loading to simulate forces from adjacent rolls and wrapped materials. The model showed that the forming roll would be safe for operation after refurbishing removed material and reduced wall thickness. This objective of this project was to provide a static and nonlinear buckling analysis of a large (200’) spray dryer under thermal, dead weight, wind and seismic loading. Although minor design changes to the structure were expected post-analysis, the safety margins were large enough, reasonable changes to members, cross bracing, and joints did not pose safety concerns. The results of this analysis showed that the structure was robust and that the client could be confident that manufacturing price estimate was representative of that for the final structure. In addition to the analysis of the erect towers, it was important to analyze the bottom-out event the towers experience as the hinged structure is lowered to the ground. Using the FE model to determine the stiffness of the towers in the lowered position, it was possible to calculate the deceleration of the towers as they experience the bottom-out event. This load was applied to the FE models with a body-acceleration. A small wind turbine rotor was analyzed to verify its compliance with the International Electrotechnical Commission wind turbine generator systems (IEC 61400-1) publication. The project started with a review of IEC 61400-1 and verification of the load calculations performed by the client. Once the loads were verified, the blade flange, shaft, nacelle and alternator housing were analyzed for worst case wind conditions. Several design iterations where evaluated which yielded a final passing design. The vibration requirements of this project state that it was imperative to identify the normal modes of the structure and ensure that they would not be excited by operation of the equipment. Submerging a structure into fluid will have a dramatic effect on the damping and natural frequency of the structure. The mass of the structure was adjusted to account for the effects of the fluid surrounding the pump within the confines of the pump can. The FE model was built with a combination of plate, beam, mass and rigid body elements. A heavy emphasis was placed on creating an efficient model with quick run times. These quick run times allowed for many iterations of model adjusting and analysis over a short period of time. Here is a case study of pump vibration and stress analysis. A static stress analysis was performed on a threaded plastic regulator. This analysis required that the FE model was built with fine detail in key locations but reasonably low overall model size for quick and efficient solve times. These key locations include area of high stress (as determined by pilot models), threaded regions and areas in contact. When a large high-strength steel gearbox casting ended up with some unintentional machining, a detailed FEA model was necessary to show that these new “features” wouldn’t result in stresses exceeding specification limits. The analysis showed that the machining did not generate any new stress concentrations above the stress limits dictated by API Specification 8C. Emergency vehicles not only carry a payload much greater than the average vehicle will see, but they are subjected to extremely abusive driving conditions. These vehicles may require additional structural support to stiffen the chassis. For the manufacturer to honor the warranty of a vehicle with aftermarket chassis components, those components must receive aftermarket analysis. To test the effects of the aftermarket chassis stiffener, a complete chassis was constructed with a combination of plate, beam and rigid elements. Several load cases were selected that represent a range of operational conditions. For each load case, the chassis was analyzed with and without the aftermarket stiffener. This collection of projects required ASTM Transverse break strength (ASTM C1492 03(2009)) analysis of several clay roof tiles. The objective was twofold: first, determine if the designs would pass the ASTM test, and second, if the analysis predicted failure, guide the next design iteration. The UH-60L SAR Martin-Baker seat pallet was modified to accommodate a 5 mm thick ballistic grade, hardened steel plate. The original all aluminum design was extensively redesigned to handle the 72 crash landing load cases as required by US Army for structural integrity. Prior engineering analysis work was followed as detailed in LSF00571 for the HH-60G Martin-Baker seat pallet installation stress analysis report. In the revised design, a lightweight aluminum pallet is attached via 18 bolts to a hardened steel plate. The aluminum component was meshed with 8-node bricks and the steel plate with plate elements. The seat structure was modeled using beam elements and was attached to the pallet via seat inserts that slide within rails that are cut into the aluminum pallet. The loading scenario consists of a 225 lb crewman that is subjected to various acceleration loads up to 20g in any one direction. The model was run in full contact model to capture the mechanical behavior between the seat inserts and pallet and the pallet against the armored plate. Results were interpreted under design safety factors that corrected the linear stress values for plastic damage based on MIL-HDBK-5H for 7075 aluminum alloy sheet plate. For example, the plastic bending ultimate allowable for 7075-T7351 plate is 131 ksi (e/D = 2.0) given a yield stress of 59 ksi. Design changes were made based on the stress results and an engineering report created for submittal to the client and review by the US Army. Results were accepted with no comment. An aluminum oxide (Al2O3) plasma tube is fabricated by brazing several arc cast Molybdenum focusing rings within the inner tube. Upon cooling to room temperature, the CTE differences between the alumina and moly components have the potential to create high tensile stresses in the ceramic component. Given the specialized geometry of the plasma tube, a detailed finite element analysis was performed. Results from this analysis were used to guide the design of new Mo internal components that drastically reduced the stress levels in the AL2O3 tube. A fracture mechanics study for brittle materials indicated at these reduced stress levels, the component would have no problem surviving installation handling and cycling thermal loading. The part is in production today. This project analyzed a large glass panel conveyor line having a length of approximately 80 meters. Inspection stations were spaced along the line where traveling cameras would be used to monitor the quality of the glass panel. These cameras would move in a non-stochastic manner but would nevertheless set up low and high-frequency vibrations in the line. These vibrations would then deteriorate the camera imaging process and cause other measurement challenges. Modal analysis was performed on key components of the line and major natural modes were shifted to limit camera induced vibration. A transient, modal-superposition analysis was also conducted to check the transmittance of the structure. It was then determined that by mass tuning of the structure, almost all of the camera induced vibration could be eliminated. The final structure was then build based on these analysis results. This line is now operating at several factories and is reported to be much quieter than its predecessors. A 10” diameter U-Joint was analyzed to determine its limit load capacity. Full contact was enforced between the yoke, pin, internal block and drive pin sub-assemblies. Material selection studies were done to determine what would be the best mix of hardened, nitrided steels or a low-alloy tool steel (h2) or a flame carburized 8630. Results from the stress analysis were used to refine an existing design through the use of a bigger drive pin with a larger diameter internal tightening bolt. The whole assembly was pre-loaded and it was noted that bolt preload was an essential engineering variable that should be closely monitored. Fatigue and limit load analysis gave hard predictions between torque and life expectancy. Based on these numbers, the U-Joint was put into production and has operated without failure. A case study of sprocket and hub bolt analysis can be found here. A small 5 KW wind turbine tower was analyzed for wind and seismic loading per UBC and ASCE 7-02. The tower was a conical steel tube built up in two sections. A complete rainflow counting fatigue analysis was performed on the tower per UBC specifications. Along with the tower analysis, the turbine power transmission shaft and blade attachment hub were analyzed for peak wind loading and steady-state fatigue damage. Results from the stress analysis work led to several design changes to improves its fatigue life. A full case study of fatigue analysis can be found here. General stress analysis work was done on a variety of small sliding clamps for the auto body repair industry. The models would often be composed of several small cast parts that would interact. The FE models would enforce contact between the adjacent parts and then loaded to the required rating. Once the design was optimized and approved for casting, initial samples of the cast part would be tested. The use of finite element modeling has allowed this one company to avoid all initial part failures and potential for downstream lawsuits. Predictive engineering has certified two large, manned commercial submarines and a third experimental submarine destined for the Mariana Trench. 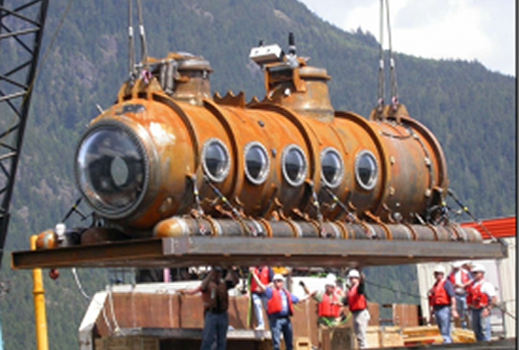 We have extensive experience in ABS and ASME PVHO codes that allows us to guide the client toward the most optimized design for a manned submersible. Complete FE analysis can be done with a nonlinear buckling calculation to validate the submarine design. Our work has been strain gauged and validated under ABS surveyor requirements. Stress analysis on several different types of transmission shafts have been done at Predictive Engineering. 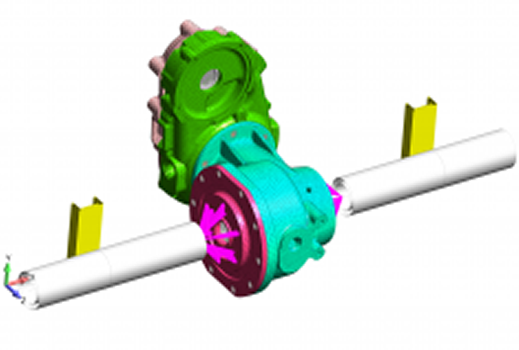 Complete transmission boxes have been simulated with interacting gear contact, shaft bearings and the total resultant load transfer to the supporting frame. Motor shaft work has also been done for a motorcycle engine, gear box, and other mechanical equipment. Although the use of linear dynamics is common place in the world of precision equipment, the development of high accuracy, predictive FE models can be difficult. This work involved the creating of a very detailed FE model of a wafer holder having more than a 1,000,000 elements. Normal modes results were experimentally checked and found to be within 1%. Subsequent follow on designs were explicitly base on the FE work and have been put into production with no downstream vibration performance problems. Fiber reinforced epoxy materials whether reinforced with graphite or Kevlar or glass are prone to developing high internal stresses due to CTE mismatches. The worst combination is that of laminates with Kevlar and graphite fibers. The mismatch between CTE’s and the high-strength of the fibers can create high internal stresses in the laminate. Stress analysis work was done on an advanced CFRP composite that was coupled to sections containing blends of Kevlar and graphite layers. Results showed that the client could safely use the structure within the specified temperature range. This was done through the use of 2-D plate models and a complete 3-D analysis of individual layers. The Femap composite laminate modeler was instrumental in generating the FE model. The electronics industry enforces strict requirements on connector and contact spring performances. Although these devices are very simple mechanical elements, accurate analysis work is required to obtain useful fatigue results. Work has been performed for several major electronic device manufacturers in the design optimization of connector springs and clips, hook devices, and small mechanical parts. The majority of these parts were fabricated out of fully hardened Be-Cu or precipitation-hardened, martensitic stainless steel (SS 302). Structural design was performed on a broad range of extruded aluminum sections to obtain an optimized design to support gale force wind loads (up to 50 lbf/ft^2). These panels are typically destined for residential and commercial roof tops. As part of the analysis, fatigue predictions were made on the aluminum components and fracture predictions for the glass cover sheet of the panel. A finite element model was constructed to simulate a broad range of military transport conditions (captive carry), launch (separation shock) and delivery (Pyro Shock) following MIL-STD-810e with reference to Method 514.4 and 516.4. The model was analyzed via PSD and Response Spectrum analysis modes. A fully non-linear transient model (LS-DYNA) was used for the separation shock analysis. Results from this work were used to validate the design of a critical piece of military armament. These clamps often involve multiple parts with contact behavior between highly stressed components. Stress analysis results are used to guide product development and optimize the tool design for weight and biometrics. Not only must the tool have a high strength to weight ratio, it must also fit comfortably in the hand of the user. All stress results are verified on production prototypes. Outstanding correlation between FEA results and tool load carrying capability has been demonstrated over seven years of product development. 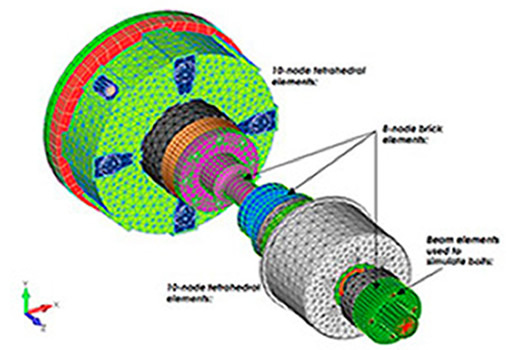 Modeling notes: FEA models are routinely created from complex sculpted Pro/E geometry files. A free body diagram was developed to map the force transfer between the pedal arm and the body components. FEA was then performed on each separate part. By performing this analysis as a piece-part job, it was not necessary to implement a nonlinear contact algorithm allowing the analyses to run efficiently and quickly. Modeling notes: FEA models were imported from SDRC I-DEAS iges geometry. 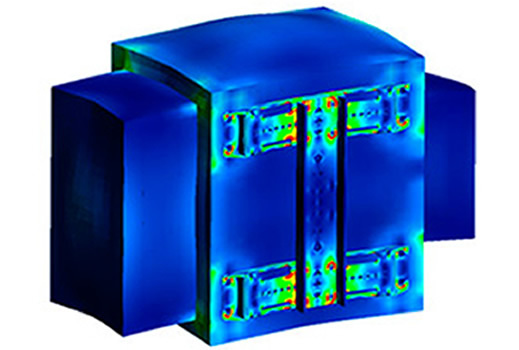 Leveraging experimental fatigue crack growth data provided by the company, fracture mechanics principles were applied in the analytical and FEA calculation of stress intensity factors (Kic). These stress intensity factors were then used to predict fatigue crack growth based on a modified Paris Law crack growth model in experimental castings. A three-dimensional (3-D) crack growth FEA model was also developed to extract full-field crack growth information. The final report showed good correlation between analytical and experimental life-cycle predictions. Finite element analysis was performed on the roof, walls, and foundation structural components. Analysis challenges were found in accurately capturing the large deflection, stress-stiffening behavior of the roof structure and in developing an accurate foundation model. The foundation was particularly tricky due to the non-linear contact between the simulated floor joist and ground connections. Analysis results are being used to drive the design process toward more structurally optimized shapes utilizing less plastic while achieving higher strengths. Insights gained during this modeling effort show that extrusions will work as well as pultrusions for most continuous shapes. The model included the PZT ceramic transducer, foam backing, brass support structure and a polyethylene cap. Stress and deflection results were obtained based on pressure loading across the face of the transducer head. Based on material property data for the PZT ceramic, the transducer head was certified for manufacturing. The assembly included a mixture of aluminum castings, forgings, and electric sub-assemblies. The analysis model was then excited through a sinusoidal sweep under a prescribed acceleration loading. Harmonics were identified within the structure and compared to experimental shaker table results. Good correlation was shown between the FEA and shaker table results. The final report substantiated that the internal electrical components of the pod would be relatively unaffected by external harmonic excitation. Stoker grates sit underneath almost every power generation boiler in the world. Their purpose is to support the fuel load (coal, wood chips, food processing waste, etc. ), to provide a combustion air stream, and finally, to remove the burnt residue (ash). Vibrating the ash transport mechanism is the massive stoker bed via an oscillating drive. Structural issues arise due to vibration harmonics and temperature induced stresses. 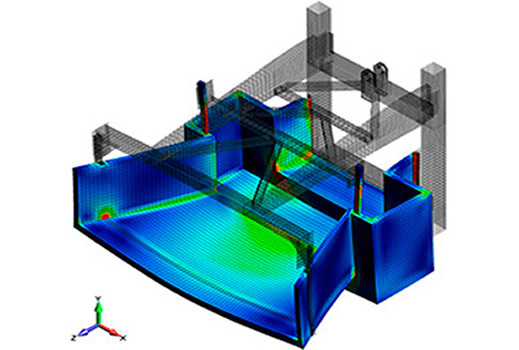 Direct transient finite element analysis was used to investigate piping stresses within the stoker grate. Models were built for the complete range of stoker grates using a complex medley of plates, beams, and spring elements. All of these models were subjected to direct transient, direct frequency and modal frequency dynamic analyses. Results from this work were used to optimize the stoker designs and to ensure extended service life. Additionally, thermally induced stresses in large castings were also investigated. Residual stresses arising from thermally induced plastic deformation were found to significantly affect the structural performance, and design changes were implemented in these castings. Dynamic derived forces were then used to structurally optimize a wear-resistant impact hammer. The goal was to lower the stresses in the hammer allowing the use of a more abrasion-resistant cast iron. Design optimization through the use of finite element analysis facilitated the development of a novel impact hammer using an A-R cast iron that was hitherto unthinkable. A fracture mechanics assessment was also included as part of this investigation. 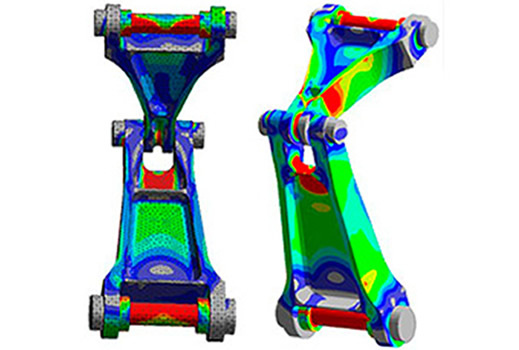 A complete suspension module was idealized into a finite element model to allow the correct application of torsional boundary conditions to the sway bar component under investigation. Plate elements were used to model the rear sway arms while solid elements were used to allow the construction of a detailed model of the welded sway bar structure. The two FEA structures were connected together using rigid links and spring elements to simulate the coupling effects of bolts and rubber bushings. 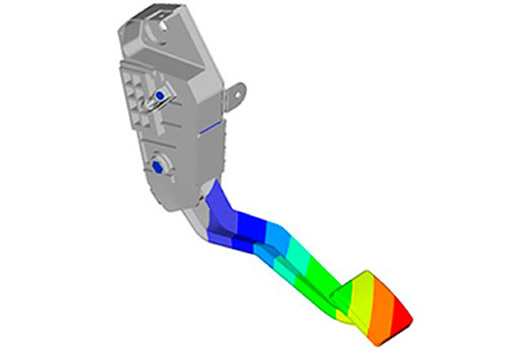 FEA results were used to validate new designs and to optimize the final design candidate. Field testing validated the modeling results and the part is now in production. 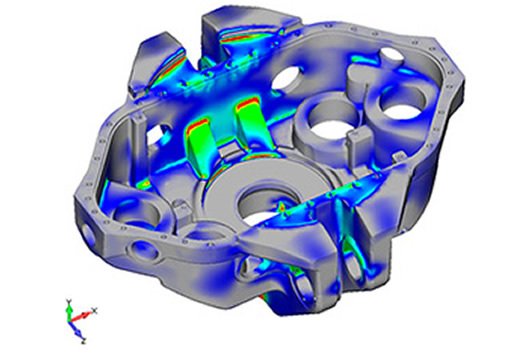 A very large complex investment casting model was analyzed for structural integrity. The wax pattern was modeled using 10-node tetrahedral elements with the investment shell modeled via a surface skin of shell elements. The assembly was then supported through risers and stiffeners attached to a steel platform. This complex assembly was then evaluated under multiple loading conditions. Stress results allowed greater confidence in the integrity of the final production casting. Stekel mills are gaining in popularity as a cost-effective alternative to multi-stand steel mills for the production of high-grade plate and sheet steels. A coiling drum is subjected to high stresses and high temperatures as it coils thick plate during the reversing Stekel mill operation. This project work was performed for a large industrial casting operation and it end user steel mill client. Several designs were virtually evaluated for high temperature deflection and strength characteristics. At the end of many design iterations, a new interior rib design was developed that provided 2x greater stiffness and lowered notch stresses at the slot opening. This coiling drum is now in service and performing as designed. Finite element analysis was performed on a landing gear structure for a major aircraft landing gear manufacturer. Aerospace analysis work requires extreme attention to model construction, mesh quality, and analysis documentation procedure. The engineering idealization of the landing gear part was not trivial. To correctly account for contact behavior between the parts, gap elements were extensively used. With the employment of gap elements, the analysis procedure becomes nonlinear. Typically this is not a hindrance but due to the models large size (approximately 600,000 DOF) run time was a significant factor in the model‚s construction. Multi-material combustion furnaces used for the generation of steam power, all have some form of stoker grate to hold the burning material (cellulose, garbage, tires, corn husks, etc.) and then to vibrate or stoke the ash off of the grate. This cycle of fuel combustion with intermittent addition of more fuel and then cyclically vibrating the ash off of the grate, all occurs at high temperatures and requires specialized cast materials and machinery that can within the high thermal-stresses generated within the stoker. When fuel is added to the system, it can drop from several meters and include heavy metal pieces. A classical impact analysis was performed based on the conversion of kinetic energy of the heavy metal chunk into instantaneous potential energy loaded on the spring supported stoker bed. Thermal-stress loads were also calculated based on the hot fuel side surface of the casting as compared to the air cooled underside of the castings. This thermal gradient was used to drive the CTE thermal-stress model of the furnace bed castings. Lastly, a modal frequency, cyclic fatigue analysis was done of the complete stoker bed to ensure that it would not fail under operation. Over the years, several stokers have been analyzed for thermal-stress fatigue under static and dynamic operating conditions. Although the fundamental design has decades of design tweaks, room is still found to make continued design improvements to lower its manufacturing costs while improving its service life. Many manufacturing processes depend upon the conveying of materials via roller chain drives. When the chain fails, production stops and loses mount. Typically, roller chains are overdesigned to ensure long service lives but under depending conditions, wear of load bearing members often induces early fatigue failure. Analysis work was done on a high-carbon still roller chain system to improve its service life in the worn condition. Models were sculptured to represent known wear patterns and then analyzed under various drive torques. Stress analysis results were interpreted with respect to the material fatigue curve and the design was carefully optimized to maintain the same original weight while delivering superior long-term service life. Pulp mills start with wood chips that are then thermal-mechanically refined into a pulp precursor. The refining process is done mechanically by feeding the wood chips or cellulose material between two large spinning disks. The outer perimeter of these disks is fitted with wear-resistant cast steel or iron plates. The faces of these plates have a blade-like or sharp-edge pattern that cuts and elongates the wood material as it is feed through the refiner. That is, the raw cellulose material enters through the center of the spinning disks and exits via the opposing faces of the spinning disks as elongated strands of fibrous material that is ready for the downstream paper making process. 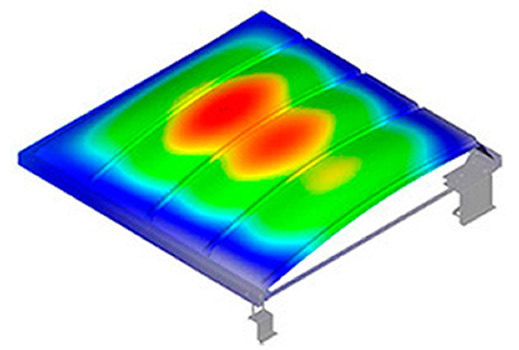 Predictive Engineering has done numerous stress and thermal-stress simulations over the years on refiner plates. The model takes into account the centrifugal acceleration effects of the spinning plates and the thermal expansion at temperature. These combined effects drive the stress state of the refiner plate. At times, a bolt-preload analysis has been done to assess the effects of the bolt clamp force in combination with the other loading. Additionally, a transient thermal-stress analysis was done to look at thermal shock effects as the refiner is suddenly brought up to production by the introduction of super-heated steam. A small surgical stapling anvil was breaking during the endoscopic procedure. The part was manufactured by powdered metallurgy and after determining that it was not a metallurgical problem, a stress analysis model was built from 3D geometry provided by the client. After a series of analyses using a hook load 40 lbf (provided by the client’s quality control department) where the stresses in the part far exceeded the material’s yield strength, it was determined that the load was too high. The client experimentally tested the stapling process and measured the operational load to be 14 lbf. Once the QC load was reduced to 20 lbf, the anvil showed no signs of breakage and the project was closed out. This project is one of our capstone projects. The client had a 100 foot long shaker that was tearing out its concrete footings due to unexpected harmonic vibration. Through a series of FEA models, the vibration response of the shaker was characterized and the design modified. The final configuration allowed a quick ramp-up to the desired oscillating frequency (transport) with no stray harmonics. Other designs were similarly engineered based on a normal modes followed by a modal frequency analysis. Some linear transient dynamic analysis work was done but the complete shaker response could be directly characterized with just a basic sine sweep analysis. The client eventually brought Femap and NX Nastran in-house with Predictive providing the start-up and continuing technical support. Since this implementation, the client has had nothing but successful startups on food processing shakers from a few feet to over a hundred feet. Stress analysis was done on the hydraulic base frame of this 100-ton press. This work was similar to other stress analysis work we have done on press frames. The frame was analysis for surge loading under peak hydraulic pressure. Tensile regions in the frame were correlated to small cracks that were discovered in the press frame. A simplified crack growth analysis was done and it was determined that the cracks would not catastrophically propagate. To monitor their growth, the press was subsequently strain gauged. 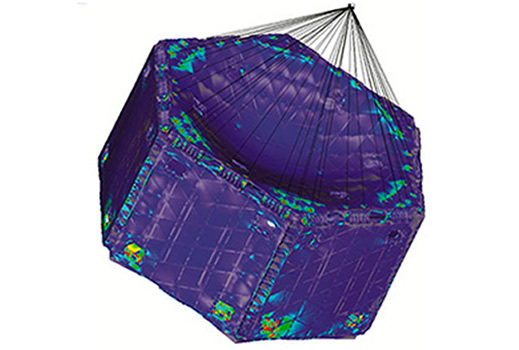 However, the cracks have remained stable per the prediction of the initial stress analysis work. A quick graphical overview is presented of our +20 years in the idealization of structures for finite element analysis (FEA) vibration analysis. Our goal is to keep our clients’ structures from experiencing disastrous resonance during testing and in service. A seismic study of the base frame for a 20,000 lb electron microscope (see Figure 1) was performed to ensure that the structure would meet ASCE 7 (American Society of Civil Engineers) and IBU (International Building Code) seismic standards. 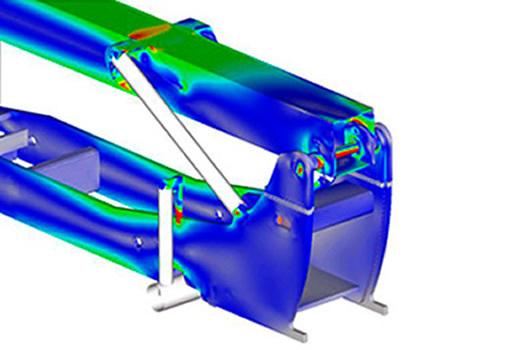 Predictive Engineering has done over 650+ FEA simulation projects in its 20+ years in business. Our experience allows us to build FEA models quickly and correctly. Predictive Engineering has done over 800+ FEA consulting projects in its twenty plus years in business. This brief overview presents just a few of our more interesting thermal-stress analysis case studies. As FEA consultants with broad expertize in thermal-fluids (e.g., CFD consulting), thermal-stress analysis is one of our core competencies. 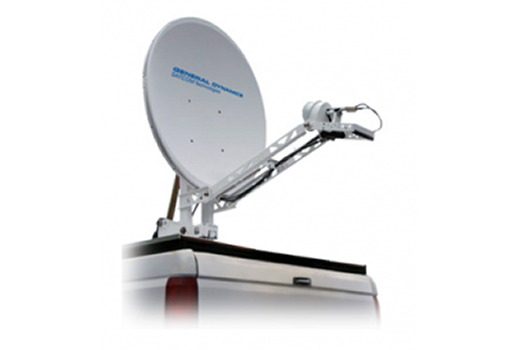 A major antenna manufacturer contracted Predictive Engineering to perform a detailed verification study of their new antenna design for mobile applications. The objective was to ensure a robust design that was still lightweight and easy to manufacture. 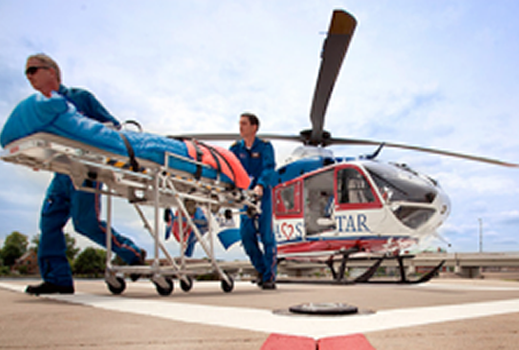 The safe medical transport of patients implies that the patient can be moved from point A to point B without harm. Having a patient stretcher that doesn’t break or eject the patient into space is fundamental toward that goal of “safe transport”. A typical design for large sprockets found on earth moving equipment and large conveyors, is to bolt the segmented sprocket onto a hub. Over time, as the sprockets are worn out, they can be replaced on-site without extensive downtown. A series of complex engineering analyses was recently completed for Pacific Rim Engineering Products (PREP). 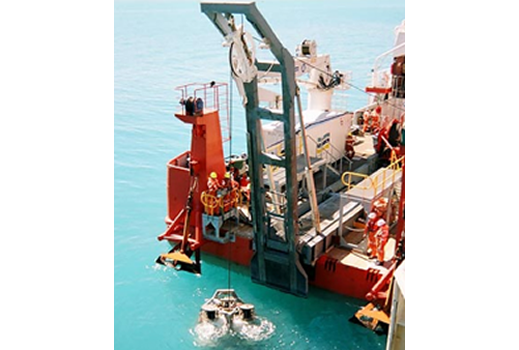 Structural and Buckling analysis was performed on a deep-diving submersible vessel. 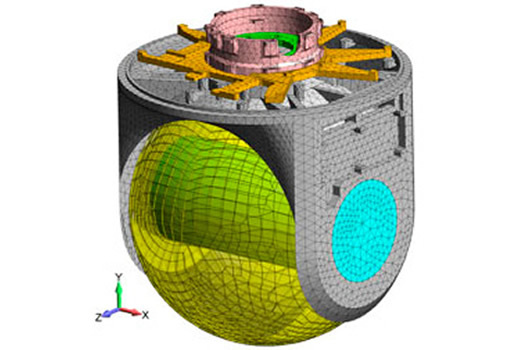 A comprehensive set of finite element models was developed to fully document the stress state in the vessel. Nonlinear finite element analysis of plastic throttle pedal assembly involving extensive contact behavior between the pedal arm, body, and cover plate. These high-strength plastic parts were rigorously evaluated to optimize the design for extreme durability. A detailed finite element analysis (FEA) was done on a new lift-truck design. The analysis work was validated against the as-built lift-truck and shown to accurate predict tower deflections under load. It is not often that a mechanician has the opportunity to execute a complete series of structural analyses on a large structural component that is integral to an aircraft's ability to function. Being a long time enthusiast for all things with two wheels, it was a blast to have an opportunity to work with Norton Motorcycles on the development of their next-generation bike. When new car or truck engines are manufactured, a cold spin-up test is often performed. During this test, the engine is spun while vibration transducers, accelerometers and pressure gauges measure the engine’s performance. Offshore engineering has grown rapidly in the last few years as the world searches for new resources. For the operators of the large hydroelectric dams on the Columbia River, enhancement of salmon runs is a key priority. This project replaced existing steel fish passageways with high-strength composite structure that would allow the use of sophisticated fish tracking magnetic field sensors. Development of the next-generation of satellite structures for the U.S. Air Force Research Laboratory (AFRL). Design and analyze a sheet metal bracket system that will support a pole mounted electronics enclosure. Structural analysis modeling and optimization of a low-cost, plastic solar panel for the heating of water. FEA results were used to ensure the structural integrity of the panel under high wind loads.